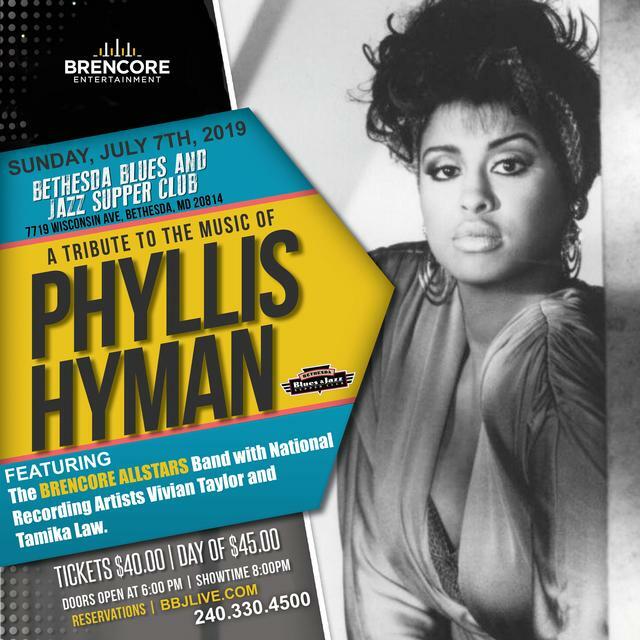 Sunday, July 7th | BRENCORE Entertainment Presents "A Tribute to the Music of Phyllis Hyman” at the Bethesda Blues and Jazz Supper Club featuring National Recording Artists “Vivian Taylor and Tamika Law” and The BRENCORE ALLSTARS Band. Everyone loves Phyllis Hyman and her music has touched a lot of souls over the years. BRENCORE Entertainment’s Tribute is one of a kind and we will cover many of her greatest hits such as “Betcha By Golly Wow”, “Old Friend”, “Meet Me on the Moon” and more. Make sure you make reservations early before the concert sells out. Phyllis Linda Hyman (July 6, 1949 – June 30, 1995) was an American singer-songwriter and actress. She is best known for her singles from the late 1970s to the early 1990s: "You Know How to Love Me", "Living All Alone" and "Don't Wanna Change the World". Hyman also performed on Broadway in the 1981 musical based on the music of Duke Ellington, Sophisticated Ladies, which ran from 1981 to 1983. The musical earned her a Theatre World Award and a Tony Award nomination for Best Performance by a Featured Actress in a Musical. Phyllis Hyman was born in Pittsburgh, Pennsylvania, and grew up in St. Clair Village, the South Hills section of Pittsburgh. Born to an Italian mother and African-American father, Hyman was the eldest of seven children. She was also the second cousin of actor Earle Hyman (best known for his recurring role on The Cosby Show as Cliff's father, Russell Huxtable). After leaving Pittsburgh, her music training started at a music school. On graduation, she performed on a national tour with the group New Direction in 1971. After the group disbanded, she joined All the People and worked with another local group, The Hondo Beat. At this time, she appeared in the film Lenny (1974). She also did a two-year stint leading a band called "Phyllis Hyman and the P/H Factor". She was discovered in 1975 by internationally known pop artist and music industry veteran Sid Maurer, and former Epic Records promoter Fred Frank, and signed to their Roadshow Records/Desert Moon imprint. Hyman moved to New York City to work on her career. She did background vocals on Jon Lucien's Premonition and worked in clubs. In 1975 when Norman Connors was laying tracks for You Are My Starship (1976) he could not get permission to use Jean Carne for the album and had heard about Phyllis Hyman, who was working at a club on the upper Westside of Manhattan. One night after a Jon Lucien concert at Carnegie Hall he went to see Hyman perform and offered her a spot as the female vocalist on his fourth album for Buddah Records. Once the title song got airplay on jazz radio, You Are My Starship went gold, catapulting Hyman's career along with Norman Connors and Michael Henderson to new heights. R&B radio jumped on board and Connors and Hyman scored on the R&B charts with a remake of The Stylistics' "Betcha by Golly Wow!"